In 1998, the WWE created a shoot-fighting tournament called “WWF Brawl for All” as a way for the genuine “tough guys” backstage to get a little more TV time. The tournament, however, did not last long as it led to a number of legitimate injuries and was also received negatively by fans and critics alike. Going into the tournament, “Dr. Death” Steve Williams was the favourite to win and WWE officials saw him as the next big rival for “Stone Cold” Steve Austin and a contender to challenge The Rattlesnake for the World Title. The tournament was designed to put Williams over, however, he was knocked out by Bart Gunn, who went on to win the whole thing. WWE higher-ups weren’t too happy with Gunn’s upset victory over Williams and so “punished” him for ruining their plans by making him take on former super heavyweight boxer, Eric “Butterbean” Esch at WrestleMania 15. The boxing fight lasted just 35 seconds after Butterbean landed a brutal right hand to the face of Gunn, knocking him out cold. I guess that teaches him for beating Williams in a predetermined, unscripted boxing fight. You can really see why the tournament lasted as long as it did. Four-time world heavyweight boxing champion, Evander Holyfield has made the odd appearance in the WWE, but perhaps his most well-remembered/not so well-remembered one was a boxing match with Matt Hardy on a 2007 edition of WWE Saturday Night Main Event. The boxing fight was introduced by the legendary ring-announcer, Michael Buffer, famous for his trademark catchphrase, “Let’s get ready to rumble!” and it was hilarious to listen to him announce Hardy’s then rival, MVP. After the bout, Hardy was left battered and “broken” but credit to him for even stepping in the ring with “The Real Deal” despite it being a work. But, what we all can agree is that the highlight of the fight was when MVP got a taste of Holyfield’s punching power after getting a little too worked up at him for not finishing off Hardy. 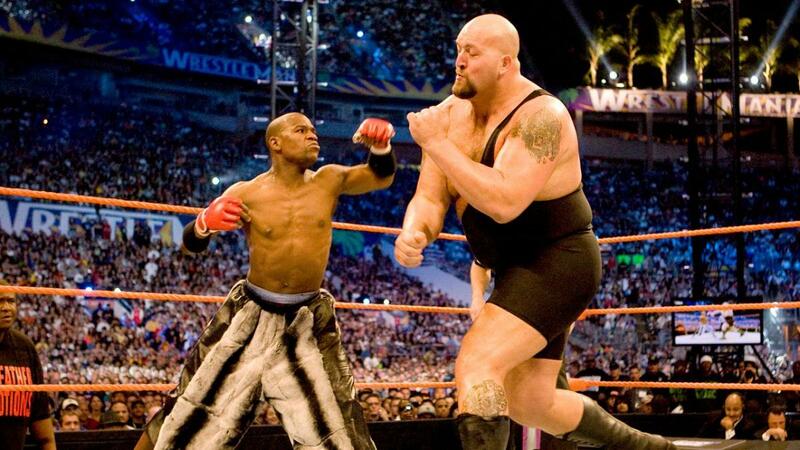 One of The Big Show’s BIGgest moments in his career… pun totally intended… was when he went one-on-one with former Welterweight boxing champion, Floyd “Money” Mayweather Jr. at WrestleMania 24. The rivalry began at No Way Out 2008 when The Big Show tried to attack a hurt Rey Mysterio to which Mayweather, who was sitting ringside, jumped the barricade and confronted “The Largest Athlete in the World”. The confrontation ended with Mayweather breaking The Big Show’s nose for real with a quick combination of strikes before bolting away from the arena. This led to a series of altercations between the two which culminated in a David vs Goliath type match at WrestleMania 24. The match turned out to be one of the most memorable celebrity matches in WWE history and like the story, David prevailed over Goliath but in this case, Mayweather got the better of The Big Show after landing a knockout punch using brass knuckles. Perhaps the most widely recognised and one of the greatest heavyweight boxers in the history of the sport, Muhammad Ali, was part of WWE history when he was a special guest outside referee for the main event of the very first WrestleMania. However, that wasn’t the first time Ali appeared on WWE television as he was involved in an altercation with Gorilla Monsoon back in 1976, where he quite literally floated like a butterfly. Halfway into the main event of WrestleMania, chaos erupted, and Ali even joined in by throwing a few punches of his own at Roddy Piper in an attempt to restore order. Ali brought credibility to WrestleMania and without his presence, who knows, it may not have been the spectacle that it is today. If you thought Brock Lesnar wasn’t intimidating enough, try staring Mike Tyson in the eyes… actually don’t do that, or else he’ll tear you apart or your ear. “Iron” Mike Tyson is regarded as one of the greatest heavyweight boxers in history, known for his ferocious boxing style as well as being a hard hitter. “The Baddest Man on the Planet” made his first WWE appearance back in 1998, where he was interrupted by the toughest S.O.B. on the planet, “Stone Cold” Steve Austin. Things quickly got out of hand when Austin provoked Tyson and that’s something you don’t want to do. Just ask Shawn Michaels… he sure felt it alright. But, it wasn’t just Michaels who got a taste of Tyson’s deadly right hand. In 2010, “The Baddest Man on the Planet” made a return to the WWE as Chris Jericho’s tag team partner in a match against DX. However, he eventually showed his true colours and as for Jericho… well, he was knocked out cold.